The more things change, the more they stay the same. 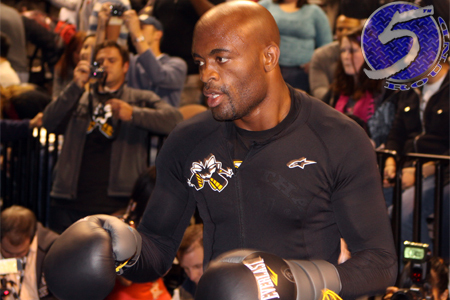 In the first episode of “UFC 183: Embedded,” Anderson Silva (pictured) shows that he still loves him some paintball. Despite Southwest Airlines’ desperate pleas for Nick Diaz to board his flight to Las Vegas, Diaz was nowhere to be found and the plant took off without him. We’ve been here before, right? Oh wait, Diaz’s manager says they had some “logistics issues.” OK, now we’ve been here before. Sara McMann’s daughter likes to play with fake poop (um, who doesn’t?). Her daughter looks exactly like her. Poor Miesha Tate could only eat only a small plate of fruit before signing posters. Poor Tate and McMann were signing at the same table … AWKWARD. UFC 183 goes down Saturday inside MGM Grand in Las Vegas. Diaz should be there before then. Right?